Join the discussion on our forums! 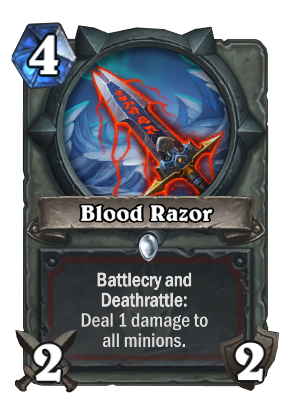 Come discuss Blood Razor over in our dedicated Blood Razor discussion topic. Used this card, realized how clunky it is against a pirate warrior who drop the Frothing first. Works well against 1/1 tokens that Token Shaman threw out, but never against those 2 hp tokens that Druid throw out. Played this weapon on turn 4 in attempt to fight a board full of 1/2 only to get countered by Mark of the Lotus or Power of the Wild. If you are using this weapon in a control warrior, you will find out that this weapon is NOTHING like death bite. Most of the time, you really needed the 4 damage to kills a single 4 hp minion on turn 4. I play 2x of these instead of Death's Bite. Along with a King Mosh And i play wild. So good is this weapon. LOL! So with the battlecry and deathrattle its attack is basically 3 on your target, along with whirlwind on the rest. A balanced version of Death's Bite which won't be abused by aggro decks like Pirate Warrior. Great if there is a new enrage or tempo warrior build that pops up, which it seems like they are pushing. But also very good in a control version to activate Execute, Sleep with the Fishes, and Acolyte of Pain. This is probably going to be the alternative to Ravaging Ghoul once it's rotated out, but for now it's a cute card and I think it could go well with Enrage decks. Will see some play for sure. Every couple expansions, Warrior gets a card that tells Whirlwind to go sit in the corner. This card is the old Death's Bite, but with added battlecry and 2 less dmg, i would say this is the son of Death's Bite. This card will see play in arena and construcked decks. Bring back control warrior 2017! this card will be defining the control decks for warriors for the current rotation i garrantee it. with powerful combos like Bloodrazor + Grommash and the new king mosh/sleep with the fishes cards. I will be rocking two of these in every deck. Exactly! This card may only be okay for quest warrior but in control it's absolutely insane! That could be one big Frothing Berserker ... besides the possibleAcolyte of Pain draw and the "1 to all on board" that could in theory also kill something from the enemy... it does the same thing as Death's Bite (1 damage area damage). The question is... is it maybe better on turn 9? Grim Patron + Inner Rage and Blood Razor to replace the Whirlwind ? It comes one turn later, but it give you a weapon and you can maybe trigger a second wave. Excellent thing to curve out of Frothing Berserker, bomb common in Arena and possible all-star in Ranked too. Being a 2/2 weapon for 4 hurts, but you just can't argue with two Whirlwinds. A little unfriendly to newer players, seeing as a few other cards have Battlecry and Deathrattle where as this one shows it has both with a comma. Nevertheless, I think it's alright. Grommash Hellscream activator on T9, nice. Should be good in most decks. But seriously, this could work well with Sleep with the Fishes and King Mosh.